At the center of the Iroquois Springs experience is bunk life. The cabin is the place campers’ call home, where the day begins and ends, with friendships, traditions and memories made along the way. Campers live in modern, spacious quarters with 10-13 bunkmates and 3-4 counselors. Every cabin is staffed with both cabin specialists, who travel with campers throughout the day, and activity specialist, who work in their area of expertise during the day, and live, eat and participate in evening activities with the group. We believe this provides the best of both worlds, with counselors traveling with campers throughout the day and additional staff to support and enrich the cabin experience. Campers live in single beds with plenty of personal space for their belongings. Every cabin is equipped with 2 private bathroom stalls, multiple showers and sinks, with running hot & cold water and electricity. Laundry is done one time per-week at our on-site laundry facility. 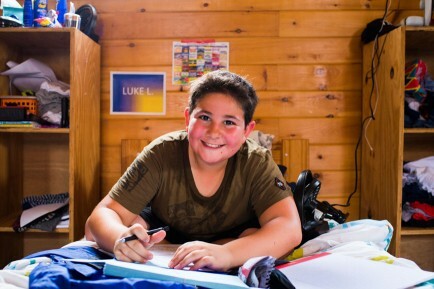 Cabins are made up of campers entering the same grade in school. Cabin placement at Iroquois Springs is made with careful consideration to a camper’s interest and personality. We thoughtfully review all camper information, and place campers in the bunk they will find the greatest success. We take the same careful consideration with staff placement and deciding which age group staff members are placed. We know the value of bunk life, and work hard to ensure the best possible living situation for our entire camp community. The traditional semi-circle layout of bunks, on both boys and girls side of camp, encourages interaction of all age groups and helps to foster a strong sense of community. This arrangement brings camp together around the flagpole to develop strong bonds and memories that will last a lifetime.